They’re crisp on the outside and tender, almost creamy on the inside thanks to the cheese and eggs. The garlic powder, dill, and spring onions add extra taste and nutrients. And they’re super easy and mess-free to make as you can simply bake them in the oven. Appetizer, snack, lunch, or vegetarian dinner? I usually make these bites for simple meatless dinners and serve them with a yoghurt sauce and extra veggies or a salad. I've also served them with smoked salmon or other smoked fish and guacamole. But they also make a great snack or appetizer at garden or dinner parties. They’re always gone in a flash and I noticed even the most veggie-averse children tend to like these "green cookies". Although zucchini ranks only number 24 on the list of world’s most consumed vegetables (right after Brussels Sprouts!?! ), zucchini is a much appreciated vegetable in many families. Its taste is mild and it requires minimal cooking which is a much welcomed bonus on busy nights. 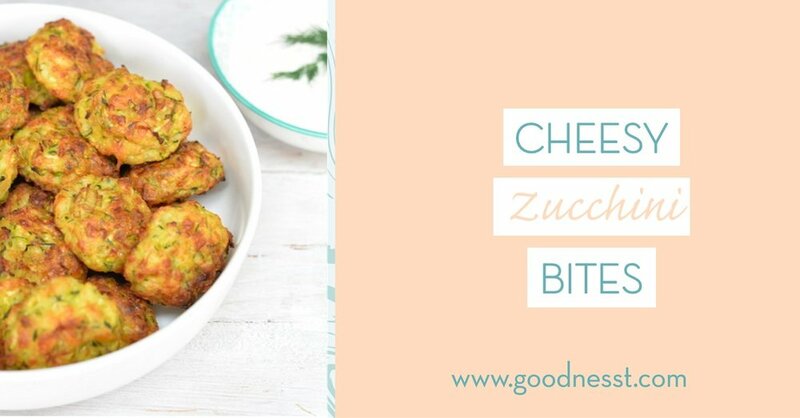 Zucchini is low in calories, carbs, and sugars and offers many nutrients such as potassium and manganese, and vitamin C and A. Since zucchini is high in water and absorbs a large amount of compounds from the soil, I highly recommend buying organic zucchini to lower your intake of pesticides. What are panko bread crumbs and are they healthy? Panko bread crumbs are made from Japanese bread and are crispier than the traditional packaged breadcrumbs. Panko contains less sodium and additives, less fat, and no saturated fat or added sugars as opposed to some traditional packaged breadcrumbs. I wouldn't recommend eating them on a daily basis as they're still high in carbs, but it's really ok to use sporadically in recipes like these. Especially if you have the habit to use commercial breadcrumbs in some of your recipes it's wise to substitute with panko crumbs instead. Oatmeal also makes a great and gluten-free alternative if your kids like an extra crisp. Although I’ve never tried it myself, you could try substituting the panko crumbs with 1.5 cup ground oatmeal (ground in a food processor). You could also look for gluten-free panko breadcrumbs which are available at some natural food stores or on amazon. 2.5 cups (120 g) panko breadcrumbs (Japanese bread crumbs, available in most supermarkets and organic stores). Look above for a gluten-free suggestion. Preheat the oven to 200°C/400°F. Line a baking tray with parchment paper. Set aside. Start by shredding the zucchini and squeeze out some of the liquid in a mesh colander (no need to squeeze out all the liquid, just a few squeezes will do). In a large bowl, stir together the shredded zucchini, panko breadcrumbs, shredded cheese, eggs, chopped spring onions, chopped dill, and seasonings until well-combined. Using your hands shape the zucchini mixture into small balls the size of a tablespoon, or larger patties if you serve them for dinner, and place on the oven tray. Bake for about 20-30 minutes until browned and crisp, flipping halfway through. Serve warm with yoghurt sauce for dipping. You can store them in the fridge for about 5 days or freeze for up to 6 months.